A lot of runners commented that the shoe was responsive. According to some testers, the product was supportive. Many reviewers agreed that the fit was perfect. Several wearers were impressed with the Saucony Liberty ISO's lightweight structure. A good number of buyers said that the upper construction was excellent. The majority of the users reported that the shoe was not only best for those who overpronate but also for those who have neutral foot motion. Several consumers loved the apparently eye-catching color schemes. It has a durable outsole, noted by many buyers. Some runners observed that the price was high. Many users commented that it has limited color variations. Many reviewers said that they need to order 1/2 size larger than their usual measurements. The majority of the runners agreed that the Saucony Liberty ISO was comfortable and supportive. They were impressed with the product's lightweight structure and perfect fit. Although several of them were disappointed with its high price and limited color options, others still recommended the shoe because of its responsiveness and sole durability. Some of them were also happy because of the product's excellent upper construction. 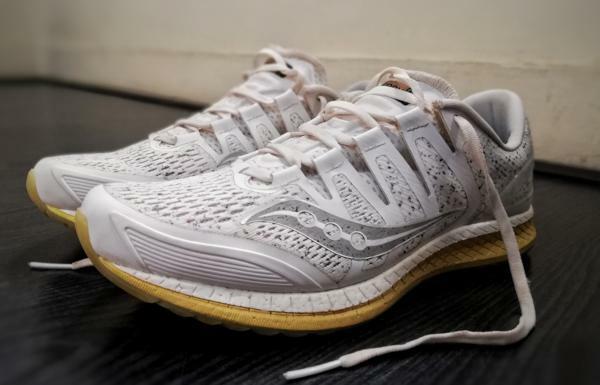 99 / 100 | RunRepeat Charles S.
The Saucony Liberty ISO is the optimal shoe for mild overpronators looking for the perfect balance between lightweight and robust stability. The lightweight stability niche is a rare find in the running shoe world. The industry typically supplies either lightweight neutral shoes with no arch support on one end of the spectrum or clunky, heavy stability shoes with fat medial posts and chunky heel counters on the other end. But for goldilocks runners who need a shoe with just a touch of arch support and still remains lightweight are left hungry. For these runners, some shoes are too heavy, others are too light, but the Liberty is “just right.” It’s a shoe that—for a high mileage trainer—keeps the weight off at 9.7 oz for a men’s size 9, but also has legitimate medial support for mild overpronators, and sufficient cushioning to keep feet and joints happy up to a marathon distance. Running shoe uppers also tend to swing to one of two extremes. They either deliver a seamless, sock-like feel that quickly becomes stretched out and loose because they lack overlays (I’m talking about you, New Balance Vongo and Adidas Ultra Boost), or they are nicely snug with a supportive wrap from using many overlays, but as a result are heavy, blister-causing, and badly ventilated (like the Saucony Omni). The ISO upper on the Liberty finds the Goldilocks zone between these two categories, being lightweight, breathable, and seamless, but also snuggly wraps the foot, provides midfoot support and maintains its structure for hundreds of miles. Again, with heel-toe drops, running shoes often take extreme positions, either sticking with traditional 10+mm drops that can lead to tight calves and strained Achilles tendons, or going full Born to Run with 0mm drops that can cause problems for runners who haven’t spent months working on efficient running form and stretching out their lower legs. The 4mm drop of the Liberty feels perfect – it gives a more natural stance than traditional 10+mm heel-toe drop shoes but also doesn’t suffer from the slapping heel-toe transitions endemic in 0mm drop shoes. Instead of glowing over the Liberty, it seems more helpful to look at how it stacks up against its competitors. Each of the following shoes is in the same lightweight stability category as the Liberty. I have run in all of them, but I found the Liberty performed better than each of its competitors as a high mileage trainer. This is a great shoe, but the midsole foams used by Adidas in the Tempo are much more responsive and firmer than the EveRun foam used by Saucony in the Liberty, making the Tempo more appropriate for high cadence track work than distance running. Both Adidas and Saucony are using TPU-based midsoles, but beyond a 10K distance, the softer and more forgiving EveRun material in the Liberty’s midsole is much easier on the joints than the dual density materials in the Tempo, which start to send shockwaves up the legs as soon as any muscle fatigue sets in. Further, where the Tempo positions you at a 10mm heel-toe drop—great for getting up on your toes during sprints—this ratio gets uncomfortable and even harsh on the feet and knees after a few miles when compared to the Liberty’s more natural 4mm drop. If you’re looking for a track day shoe, the Tempo is great. If you’re looking for any high mileage, go with the Liberty. The Guide and the Liberty come from the same brand and sit in the same light stability category but are catering to different consumers, one at a high price point (Liberty, at $160 retail), and the other at a middle price point (Guide, at $120 retail). If you can spare the $40, the upgrade to the Liberty is worth it. Your 40 bucks will buy you less weight (10.3 oz for the Guide men’s size 9, versus 9.7 oz for the Liberty, which seems like a small difference but makes for a big improvement on those long runs), a more flexible forefoot for a smoother heel-toe transition, and a more form-fitting upper with better overlays that gives midfoot support without causing pinching or irritation from extra materials, like the upper on the Guide. On paper, the Vongo and the Liberty seem almost identical: both are using new midsole foams (Fresh Foam in the New Balance, EveRun in the Saucony), both have light stability features, both have the same heel-toe drop, and they both have similar weights. The Vongo however, is $40 less expensive. I liked the Vongo, but what an extra $40 buys you in the Liberty is a superior upper, a more durable midsole, and an ounce less weight. Where the Vongo’s single-piece, overlay-free upper stretches out and turns into a loose sock after only a few runs, the Liberty’s ISO fit upper feels seamless, maintains its secure midfoot wrap, and holds a snug fit throughout the foot for hundreds of miles. I had some durability issues with the Vongo’s midsole too, feeling the cushioning and arch support go flat after less than 100 miles, where the Liberty has kept my arches supported and provided high-rebound cushioning over a much longer period of wear. Like the Vongo, on paper, the Lunarglide looks almost identical to the Liberty in terms of weight and stability. The three primary differences are the durability of the midsole material (much better in the Liberty than the Lunarglide), the heel-toe drop (4mm for the Liberty, 10mm for the Lunarglide), and the weight (9.7 oz for the Liberty, 9.3 oz for the Lunarglide). The Lunarglide is slightly lighter mostly because it does not have a real outsole and instead uses “laser” etchings to provide grip and flexibility. It also saves weight by relying on a single piece of contoured foam to provide arch support, instead of a medial post. This lightness feels great for the first 50 miles or so in the shoe, but like most lightweight shoes, the Lunarglide’s foam quickly loses its spring, the arch support compresses, and the lack of a proper outsole erodes the shoe like it’s been put under a belt sander. If you don’t mind throwing away your shoes after less than 100 miles and don’t mind traditional heel-toe drop ratios, the Lunarglide may be a good option. But in my experience, the 0.4 oz the Lunarglide saves you isn’t worth its durability problems, and the Liberty’s lower heel-toe drop feels more comfortable. Finally, the Liberty more than made up for its $40 higher price by maintaining durability and delivering high quality runs for well over 300 miles, where the Lunarglide went flat after less than 100. Running shoes are not strictly good or bad; they’re just better or worse for certain types of runners and certain running conditions. The Liberty is optimal for mild overpronators looking for a premium, lightweight, high-mileage road trainer. If you’re a severe overpronator and need more arch support or have a neutral gate and need no arch support, the Liberty isn’t for you. If you’re on the market for a track day shoe, a trail shoe, or a budget shoe, the Liberty is also not your best choice. 1. For your track workouts, you may choose a lighter, more responsive shoe like the Adidas Adizero Tempo 9. 2. If you’re hitting the trails (anything more technical than crushed gravel) or running in inclement weather, the Liberty is also not your best friend. While the flat, single-piece outsole has perfect traction on dry roads, it will not deliver grip on rocky trails, mud, or snow. I ran a half marathon in a Nor’easter in the Liberty: it quickly became waterlogged, and the sock liner got bunched up in the toe box area, making for a less-than-ideal experience. 3. If you’re running on a budget, the $160 price may mean the Liberty isn’t for you either. More affordable options may be last year’s sale model of the Liberty’s competitors, listed above. That said, if you can cobble together the money, you’ll get every dollar’s worth in mileage due to the Liberty’s excellent durability. There is a certain connotation that runners and shoe manufacturers alike share when it comes to stability running shoes - a kinda-bulky-low-key-dad-running-shoe. This stereotypical image is occasionally challenged by a number of pairs that come out every now and then. Saucony Liberty Iso is definitely one of those shoes that stands unique among the more “traditional” stability shoes. It provides a very secure, stable, comfortable, cushioned and light ride, which is not that common among other shoes of the same category. Saucony Liberty ISO comes with a full-length Everun sole, which is basically Saucony’s version of Adidas Boost, but slightly more firm. The Liberty is the only shoe out of two in Saucony’s arsenal to include a full-length Everun sole. Other shoes, like the Kinvara, usually have an Everun Topsole only. The Liberty runs true to size and comes with a mesh upper that is light and breathable. The toe box is a bit shallow and not super wide, but it won’t be restrictive nor tight. However, it’s worth mentioning that the toe box has some sort of a firm material which might be annoying and potentially get you black toenails if your feet swell up in a long run or on a hot day. So personally speaking, if I could turn back the time, I might have got a half size larger. I would advise you to try them first before making the purchase. As a runner who needs a touch of support and stability, the Liberty certainly offers a lot to the table with two key elements. First, a medial frame unit, that helps in slightly correcting your stride whenever you overpronate. The correction is not aggressive nor does it hurt your arch/feet. The other key element is the Isofit dynamic lacing system. This helps you choose a fit that is suitable for your foot, as well as offering a good lock without being too restrictive so that you could enjoy a comfortable run without any hot spots or annoying slippery tongues. Speaking of tongues, the Liberty comes with a very soft and thin one without any cushioning. It’s also worth mentioning that there’s a heel counter that is attached to the shoe. It gives a slight structure to the heel compared to the unstructured heel found on the Saucony Freedom ISO. I found it to be flexible and not too rigid. So if you are looking for a shoe that must have a solid heel counter, this might not be suitable for you. Saucony has been focusing lately on producing shoes with a more minimalist heel to toe drop. Most of their line has either an 8 mm drop or a 4 mm one. If you are not familiar with the concept of “drops,” it’s basically the difference in height between the heel and the toe. Most shoes on the market come at a 10 mm drop. Stability shoes, in general, follow this traditional difference and might even have a higher one like a 12 mm difference which usually favors landing on the heels rather than landing on the midfoot due to the heel section being heavier than the toe. 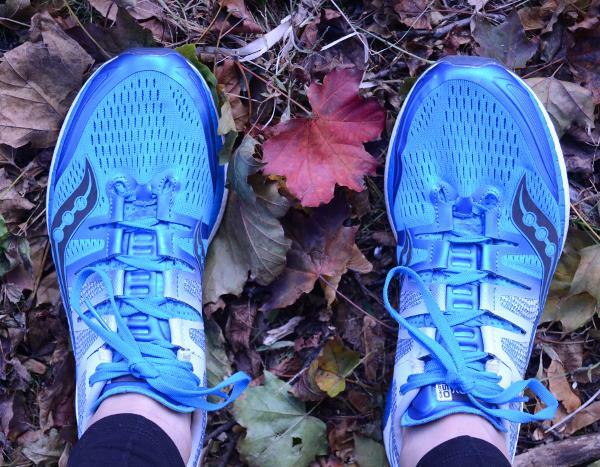 The Liberty is one of the few stability shoes that comes with a 4 mm drop, like its more neutral sibling, the Freedom. This profound difference makes you land more towards your midfoot and toes. So if you are used to running in other stability shoes, be careful that the transition to the Liberty might come with some pain in your lower calves and Achilles as the low drop is engaging more of your lower leg muscles which aren’t usually targeted by the higher drop shoes. Personally speaking, I find myself more comfortable running in a low drop shoe with a more correct running gait despite the lower leg pain. The key here is to ease into your transition and start by running shorter distances and then starting building up the mileage. My first run with the Liberty was very memorable as it was one of my fastest runs ever! The shoe is really fast, which is a term that I sometimes read in shoe reviews but never really understood until I tried the Liberty. There’s something about the combination of Everun, the low drop, the lightweight and the medial unit that just makes the shoe very comfortable and fast without any pain or slippage when I’m taking corners. The shoe is very durable, and I predict that it would be able to go past the 600-mile mark. If you are an overpronator who is tired of the traditional stability shoes and want to have a fast shoe that provides a touch of stability, I highly recommend the Liberty. I'm on the trails a lot, but when I hit the roads I do like a shoe with a little bit more support. I find that the Liberty ISO provides that with the full-length EVERUN midsole, and at the same time it still has a little bit of flexibility that I like. The Saucony Liberty ISO is a road running shoe that is intended for runners who are moderate overpronators. It utilizes the ISOFIT system. The technology's purpose is to provide a sock-like feel. Featured on the outsole is the Tri-Flex Crystal Rubber, the goal of which is for increased durability and adaptability. The midsole utilizes the full-length EVERUN Topsole which aims to provide additional cushioning. The Saucony Liberty ISO follows the standard shoe measurements when it comes to sizing. The shoe is best for those who want to take any short and long-distance road running activities. The available widths are B - Medium for the women's version and D - Medium for the men's version. The Tri-Flex Crystal Rubber is integrated into this product. This material's purpose is to help increase the shoe's adaptability, flexibility, and durability. The creators of the Saucony Liberty ISO made the EVERUN Topsole construction, which is meant to deliver an additional layer of cushioning. This material's primary purpose is to improve energy return. In correcting overpronation, a Medial TPU Guidance Frame is utilized on the inside part of the shoe. This rigid plastic piece helps in preventing and controlling overpronation. Increased energy return and shock absorption are offered by the full-length EVERUN midsole. This material is essential in achieving a more consistent ride and smoother landings. A stretchable mesh called the ISOFIT creates a sock-like and soft feel. The technology is strategically placed to primarily adapt to the runner's foot movements, shape, and size. It allows the foot not to feel restricted. Lightweight breathability is offered by the Engineered Mesh, which has also been reconstructed to be denser and more supportive. The manufacturers made this component of the shoe to keep the runner's foot cool and dry, especially on summer runs. The shoe has a Heel Support Frame which is essential in supporting the heel throughout the gait cycle. It helps the runner to move more confidently and securely with every stride.